The laws of thermodynamics describe the essential role of energy and explain and predict the direction of changes in matter. Suppose we had two objects of different temperatures, one at 100°C and the other at 0°C, and we put the two in contact with one another. Spontaneously (that is, it happens on its own), heat will transfer from the object with the higher temperature to the one with the lower temperature. 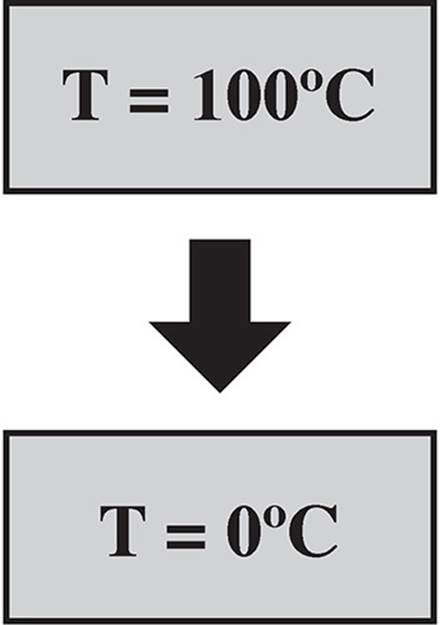 Over time, the colder object will exhibit a temperature rise, indicating that energy has transferred from the warmer object. This is an example of heat transfer. Energy transfers due to molecular collisions. As the faster moving molecules collide with the slower moving ones, they transfer some of their energy, changing the speed of both molecules. Energy can also be transferred from molecules to their surroundings. Think about a steam engine; as water is converted into steam, the water molecules in the steam will collide with the piston inside the engine, imparting energy into it. If enough energy is imparted, the piston will start to move. When gases expand and cause things like pistons to move, we say that the gas is doing work on the piston.